AN-01 Recalibrating the Tower of Light of AN ~DONE! The Center of the Tower of Light of AN was originally planned to be raised 15 cm (6 in) above the ground. Unfortunately, the finished circle is about 25 cm (10 in) above the grass. This gives the center the wrong feeling, as the top of the center should be easily visible from the outside circles. 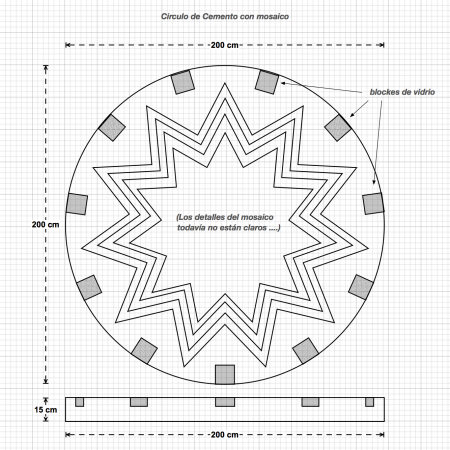 But since nothing is a mistake, we’ve decided to raise the inner five circles by 11 cm (4 in) and build a step upwards after the 6th circle. The magenta stripe in the second picture is just for making it clearer, where the new step would be inserted. It would be made of river rocks in their natural color. Although we originally considered the too high center as a “mistake”, we now see that raising the inner circles is absolutely perfect. This brings the design of the Tower of Light of AN closer to how it is meant to be and will greatly magnify the energies. 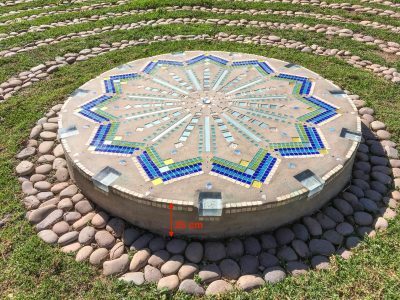 When we do this, we will also reset the river rock circles in the Tower of Light by setting them in cement. This will keep them in position, (so they aren’t knocked out of place by dogs and hoses), and they won’t need to be weeded. We hope to finish this project by the beginning of October. Remove the stone circles 1 to 5. Carefully remove the grass circles so they can be put back on the raised part. Add dirt into the area between the center and the 5th circle of 11 cm (4 in) in height. Add a river rock step inside the 6th circle that is stable enough to step on. Make sure the dirt is compact, so it does not sink in, when we dance inside the inner circles. On the raised part: put back the stone circles 1 to 5 and the saved grass. We also want to cement the river rocks in all the circles so they won’t need to be removed and weeded each month. The estimate for the work including workers and materials for this project is from $450 – 800. This work has been completed and it makes a huge difference! The Tower of AN is much stronger and more beautiful. I read all of your books several times (maybe 15 years ago) and now again and I am still very, very happy when I read them. Thank so much for these beautiful, powerful and full of love – pages which remind me where I come from. I hope one day I will have the chance to visit you there. All the best and LOVE from Austria (Salzburg).